Itwas one of my resolution of this year as a blogger to try out more bread recipes and I started to follow it very obediently. 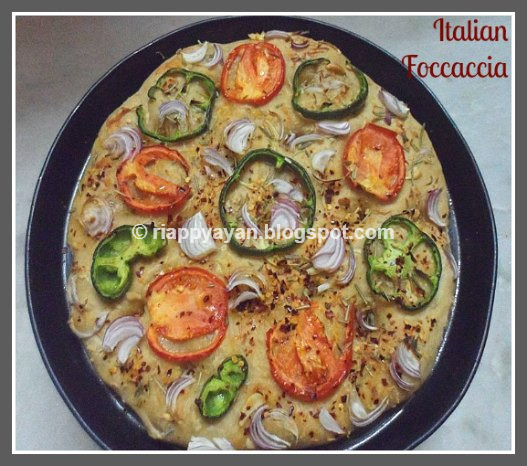 On 31st evening, what I was doing, I was making Focaccia in my kitchen so that I can serve a colorful Focaccia on the first day of the year for breakfast and planned it to be the first post of this year. See, I am so serious about my resolution :)) Wishing everyone a happy, healthy and colorful New Year !!!!!!!!!!!!!!!! 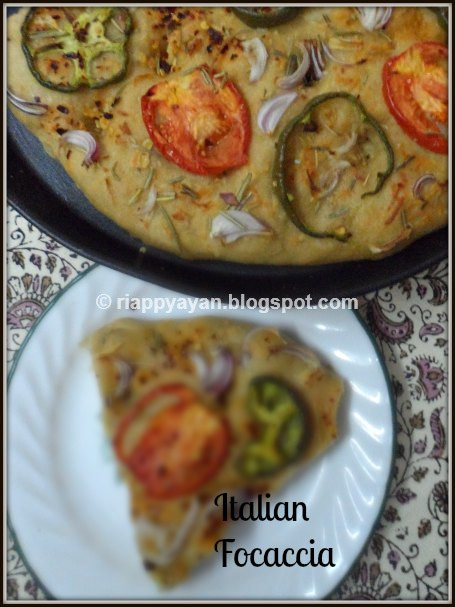 Focaccia is a flat oven-baked Italian bread, similar in style and texture to pizza doughs. 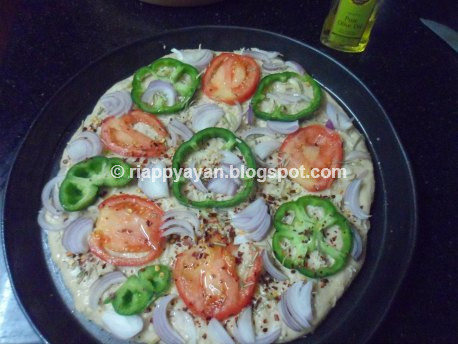 Main ingredients includes high-gluten flour, olive oil, salt, water and yeast like other breads and often topped with herbs or/and vegetables like onions, tomatoes, olives, capsicum/peppers and even meat. Focaccia is very popular in Italy and it is used as a side to many meals, as a base for pizza, or as sandwich bread. Focaccia is present in many variants in Italy itself. It varies with just one ingredients from one province to another, even a sweeter version is also available. Instant Dry yeast : 1 tsp. Olive Oil : 3 tblsp. Take a big bowl, take warm water, sugar and yeast. Stir to mix well and let it rest for 10 minutes. You will see froth on top of the bowl, then you know your yeast is working. In a separate big bowl, take both the flours and mix salt and 1 tsp. of herbs to it. Now make a small well and put the yeast water in it. Slowly start mixing the flour and you will get a very sticky dough. Add 1and1/2 tblsp. olive oil now and mix with the sticky dough and knead some more, at least 10 minutes until you have a smooth dough. Take a well-greased big bowl(so that your dough has space to rise) and place the dough in there, cover with a damp kitchen cloth and place the bowl in a warm place like closed microwave. After about 1-1.5 hr., you will see the dough has doubled and became soggy and sticky. Take out the dough on a floured surface and knead the dough for a minute or two, punching down to deflate the air inside it. Make a smooth and elastic dough. Now take the baking tray you are using, grease it with olive oil very well. Now place the dough on the tray and with your finger tip and palm, spread the dough over your baking tray. Cover the tray once again with the damp kitchen cloth and place on a warm place for the second rise. This time we need not necessarily want the dough to double but rise to at least 50% more to its original size. In the meantime, we will prepare our herbed olive oil. Heat 1tblsp. olive oil in a small pan. Once heated then remove from flame, add chopped garlic, rest of the herbs. Mix well and herbed old is ready. Once the dough in tray is ready at distance of approx. 4 inches put dimples on the bread dough using your finger. Apply herbed oil allover the bread. Add your desired veggies and finally sprinkle some grated cheese. I sprinkled some chilli flakes too for some extra hotness. You are done. Pre-heat oven to 180 degreeC and place the baking tray on a middle rack and bake for approx. 25 minutes or till upper crust turns nice golden brown. 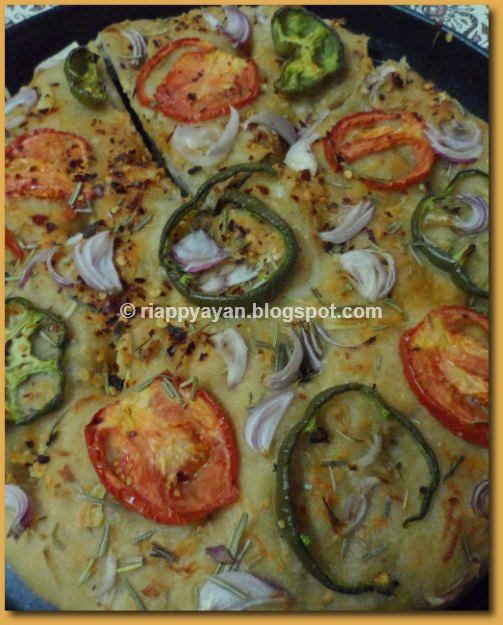 Delicious and lovely looking focaccia. Excellent preparation.